I’d like to think that the name Pitlochry is difficult for almost anyone to say convincingly. It took me a good number of years living in Scotland before I could pronounce many of their town names. So why is this the name of a building around the corner from me? I know I’ve written before about the interesting trend of not having real addresses in India. It is true that I do not really have a street address- only a building name and a naive hope that friends and delivery-people alike can somehow locate my abode. But the more hilarious (sad? preposterous?) part of this equation is that most of the building names are not easy for any Indian person to pronounce. 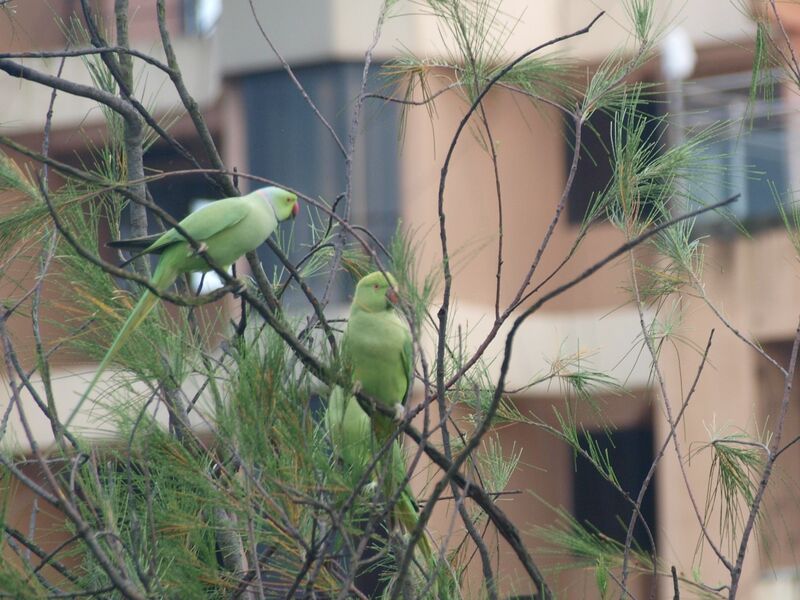 My building is one of the more innocuous ones — La Paloma — and even that is difficult for most people. The building next door to us is called Chez Nous. Imagine not knowing English or French and then trying to pronounce those letters together. Two of my neighbors who live in Chez Nous often describe their pronunciation to delivery-people as “Chez Noose” (with a hard C-H like chair and a full pronunciation of the Z). It’s all they can muster to get anyone to find them – otherwise their pizza will be carted around by a person looking for a building with the words ‘Shay Noo’. Down the street from Chez Nous is another inexplicable french masterpiece: C’est Moi. Do they think it adds a touch of elegance to the dilapidated exteriors to make their names unpronounceable but foreign? The funniest part of C’est Moi is that the I has fallen off the end of the sign – so if you lived in that building you’d probably have to describe your place as ‘Sest Moe’. It would be funny if we weren’t already on the one-way street with no discernible landmark without a main road to turn off of. We live in a bizarre European hamlet that no one can find with buildings like Chez Nous, Suares and Rendezvous. I couldn’t believe I had to stand here and watch another heated discussion over cardboard. Our security guard and the man from our moving company were going ten rounds over which of them got to keep the boxes after all of our belongings had been removed. I watched, bemused, but nothing could keep me from the happiness of seeing my own items slowly emerge from their lucrative cardboard containers. We have been in our apartment since June 30th. We had been told our shipment (clothes, kitchenware, some furniture – everything) would arrive the next day, on July 1st. Of course, as with most things here, it took quite a bit longer. Our shipment couldn’t be scheduled to come into India because the monsoon and overbooking had backed up flights. The monsoon?! As though they didn’t know a monsoon was coming and couldn’t have planned for it. Then the airline left half our shipment behind on the layover in Qatar. Then it had to get through customs. But here it was, 15 days late, and I still couldn’t get unpacked because somehow cardboard needs to be a recurring theme in my life. Daniel finally stepped in. There he was, my mediating hero, solving the second great cardboard dilemma of 2010. Our security guard went downstairs, triumphant at his (partial) victory, while the movers continued to unpack. As each item came out, our apartment felt more like home. But I was also struck by how many items we’d brought that we wouldn’t need. Every cotton polo shirt or light spring cardigan now appears to me as heavy as winter clothing. I’ve gotten so used to wearing light kurtas and thin cotton leggings or flimsy nylon t-shirts and linen capris. While we packed most of our winter clothes, we were still foolish to think that we could just fully pack up our old apartment and transfer it uniformly to the opposite side of the world. A good percentage of our stuff is going to be shoved to the backs of closets, never to see the Indian light of day and only re-emerging into the New York air. But it’s ok because we’ve already been preparing ourselves for some of these replacements. Nisha has bought pans for roti’s and a pressure cooker for rice – our wok will probably just get a year off. I’ve already stocked up on free-flowing lightweight clothing and so the out-of-place elements in my closet will just seem new again in a year. Even our kettle will get a breather, since Indian chai needs a pot to boil both water and milk (used in the same proportion). But while some items are replaced, for the most part it’s a merging of the two worlds – our kitchenware sits in a cupboard next to one of the ubiquitous gas cylinders everyone has here. Photos of family and friends now intermingle with our new bar and rocking chair. We can watch our DVDs while looking out the window to see huge Indian crows staring back. It’s a new kind of home — but with our belongings arriving late on Indian time, we’d at least been given a couple weeks to prepare. I made 200 rupees today. That may sound impressive. And perhaps it is. But you should know that 200 rupees equal a whopping 4 dollars and 28 cents. But I made it from selling something that I formerly considered trash. I’ll start at the beginning. Yesterday I said to Nisha and Ray (the manager of all the work going on in our apartment, who today fixed a broken light, our broken toilet and a broken doorbell. There seems to be always something new!) that I needed to find a way to throw out the many furniture boxes we had sitting around. I couldn’t put them outside because of the monsoon but they were just taking up space in the spare bedroom. “Throw out?” they both responded, looking at me like I had three heads. I stared back. “Well, we have to get them out of the house eventually,” I said a bit sheepishly. I didn’t know what I’d said that was incorrect but clearly I was in the wrong somehow and I might as well be preemptively embarrassed for my own stupidity. “I tell guy at gate if they come by to send them up,” Ray said, as he walked out of the apartment, clearly on a mission to inform my doorman (or “guy at gate”, apparently) to send strangers into my house foraging for heavy-duty paper products. “Yes,” she said, “Good. We’ll get them to 200.” She talked animatedly to the man in charge, clearly rejecting his initial offer. He moved away from her and started to look at the boxes more closely. I wondered what on earth he was trying to find. It clearly was part of his negotiating strategy. To make the point, I said some make-believe gibberish about pigs flying in my most stern voice to see if I could get Nisha to laugh. She did, but with her back turned to the men all they heard was my insistence. Clearly I was VERY serious about pigs flying. But it worked and we had a deal. The men agreed to 200 rupee and began to collapse and take away the boxes. Nisha took the plastic wrapping off some of the boxes. “Is ok if I take these? My roof is leaking from monsoon and this will help.” I wanted to cry. I wanted to go over to her house and single-handedly fix her roof (as though I could do that without breaking her roof and/or killing myself). I wanted, though, to not embarrass her. “Yeah of course. Take whatever you need!” I said, as though my enthusiasm for plastic somehow made it all better. But it’s only ME who is embarrassed. She seems to feel this is a normal question that shouldn’t faze me as it is clearly not fazing her. It’s a funny thing, the American guilt. It’s clearly one sided and not even recognized here. She’s not upset; she just wants some plastic. It’s me who is embarrassed, not her. It’s me who has to get over it because she was never in it or under it. She folded up the plastic without noticing my own pathetic internal Greek tragedy. And the boxes continued to be collapsed and taken away. A moment later, once they finished, I opened my hand and two crisp 100 rupee notes were pressed into it. Success. It was my very own trash into treasure story, but clearly I could take no credit for the victory. It marveled in the uniqueness of that experience. “Some things are very different here,” I said to Nisha. Just then the monsoon started up again and the noise took over the room. “And this constant rain is different,” I said. “Even in winter? Or spring?” She was clearly shocked at the idea of rain in November or March. That question, that kind of moment, is when I’m reminded that there’s a whole world whose experience with even the most basic parts of humanity – such as rain – is completely different to my own. There’s no right or wrong – just a whole new way to see the world. I had spent a larger portion of my day at a coffee with the American Women’s Club than I did with the boxes or the conversations about rain. But the interaction with the day-to-day life of India stuck with me more than the attempt to find remnants of home here (even if it was nice to be around a bevy of American accents for 2 hours and I will definitely be happy to have those coffee respites while I’m in Mumbai). What a world of learning I’ve entered into. Today: rain and cardboard. Tomorrow, who knows what’s next. We’d been lucky enough to be invited to the home of a friend who lives with her family in South Bombay. Being in a home around a family made Mumbai feel like my own safe home. But we had to escape the previously safe roads before the city turned into the proverbial pumpkin at midnight. No one knew what the scale of the bandh would be – but we didn’t want to be out and about to find out. 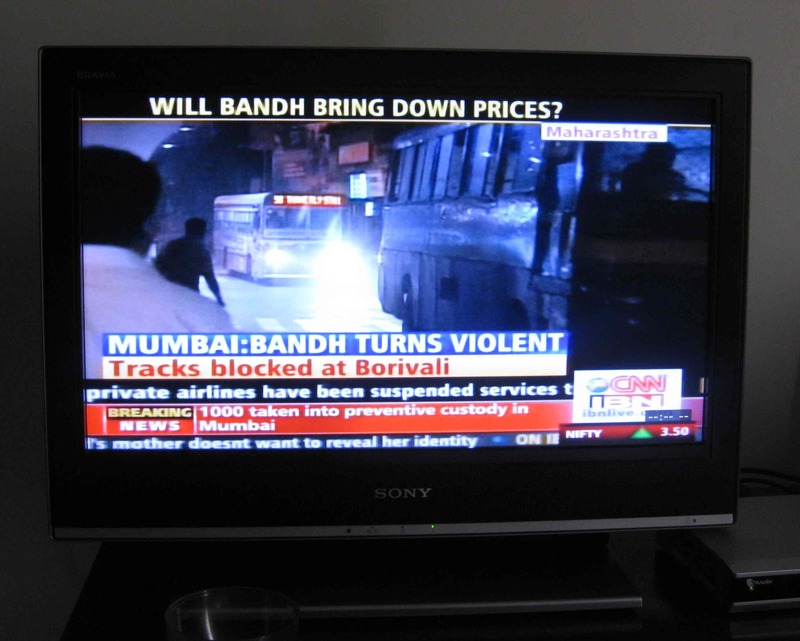 A bandh, as I had learned earlier, is the Indian version of a strike. This one was called by the opposition parties over rising fuel prices and the end to some fuel subsidies. Unlike any strike we see in the US, this bandh was stopping a billion people from working, shopping, going to school or safely traversing their streets. And even more unlike the US, while the opposition parties sponsor the bandh, it doesn’t just effect the supporters who decide to come out and rally– it shuts the whole country down. It would be as if the Republican Party declared a strike against the health care bill and every person across every state in the nation stayed home for an entire day. It doesn’t mean that the whole country was necessarily in agreement with the bandh or that every part of India was massively affected. Some cities saw much more active protests and riots. Other cities didn’t appear to participate on any large scale. And even on a more individual level, most of the people we spoke to here in Mumbai were closing shop or staying home more out of a fear for safety than a sign of solidarity with the protesters. Then again, there were reports of protests turning violent even in Mumbai, so there clearly was anger over the issue for some segments of the population. We’d been warned that if we did go out, we should wait until the afternoon, since the protests usually were more active in the morning in order to catch the news cycle and get coverage (some things NEVER change wherever you are). Last night was our final evening in the guesthouse, since our furniture had arrived and we could officially move in – so our plan was to head over to the apartment in the morning. We figured since we live in suburban Bandra (and most of the municipal buildings and transport centers are in South Bombay) the likelihood of the protesters reaching us seemed slim. But as we watched news coverage in the morning of some of the protests across the country and in Mumbai we decided to heed the warning of the native Mumbaikers we’d spoken to and wait until the afternoon to gather our suitcases and make the short 5 minute drive to our apartment. When we left the guesthouse, the street was as empty as if it were 3am – but the sunny skies turned the scene upside-down. Shops were closed and very few cars drove in the streets. The frenetic soul of Mumbai seemed to have vanished and all that was left was the city’s shell. But the emptiness didn’t seem fearful. Our gut instinct about our portion of Bandra not being a target appeared correct, and we made it easily over to our apartment (so much easier than normal, in fact, since we had no insane traffic to contend with). We lived out the rest of the bandh in our own oblivious unpacking mode. 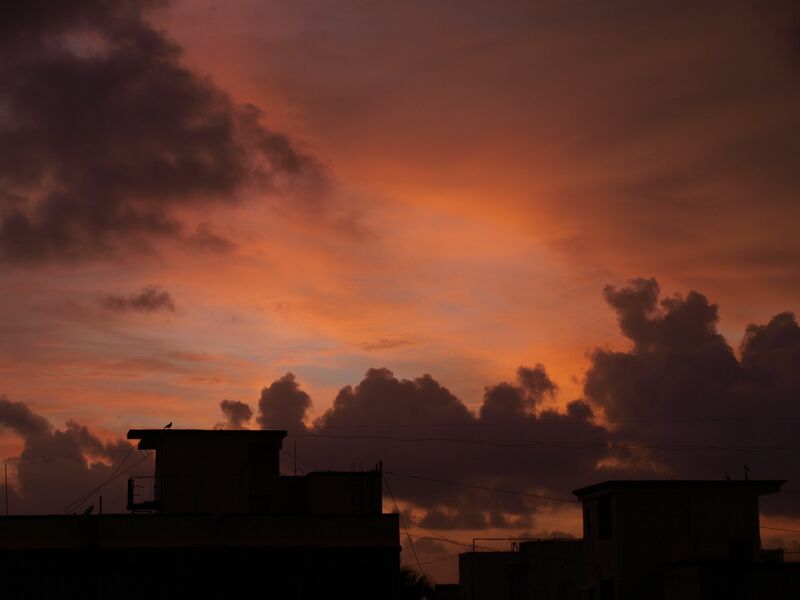 By the evening both the traffic and the monsoon had returned – all was back to normal. It’s yet to be seen whether the bandh has any political impact. But whatever the outcome, I have to admit that I, at least, was impressed by the massive feat of stopping approximately one out of every six people in the world in their tracks for a day.